that deposits which are at such low levels that traditional extraction methods may not be economic may instead be amenable to this technique. Whereas traditional extraction might require the whole volume of the soil to be dug up and chemically processed, extraction with hyperaccumulating plants would require a crop or successive crops to be sown on the area and later harvested. The harvested crop, which is effectively a higher concentration ore, is then processed to extract the metal. Phytomining has been proposed for gold extraction and has been subjected to field trials in Brazil, New Zealand and the US (Anderson et al., 2005). Unfortunately gold is not accumulated at sufficiently high levels in plants when grown naturally on soils containing gold at levels which are below those commercially viable for traditional mining techniques (this varies with the gold price but is generally less than around 0.1 ppm). Therefore it is necessary to add a complexing agent to the soil to assist in the dissolution of the metal so that it may be more readily taken up by the plants growing on the soil. For gold the use of cyanide or thiocyanate are the obvious candidates to assist in dissolution with thiocyanate having been used in large scale field trials. In addition to the rather more passive nature of this form of "mining", where the soil does not need to be shifted, phytomining has the advantage of being aesthetically more pleasing: a field full of crops is more appealing to most people than mounds of mine feedstock and mine tailings. The environmental impact of phytomining may also perhaps be less than traditional mining, although it must be recognised that chemicals that may not be desirable in runoff are added and ploughing, fertilising and harvesting, and industrial cropping procedures, are necessary operations. So far field trials for phytomining have only been applied to gold, although there is mention in the literature of the possibility of also applying this to silver (Sheoran et al., 2009). However, this is unlikely to happen in the near future because of the significantly lower value of silver than gold. Accumulation of metals can also occur externally around living organisms, and may be the origin for some native gold ore deposits (Southam et al., 2009). It has recently has been shown that metallic copper nanoparticles may also form in this way (Weber et al., 2009). If the emphasis is changed from using plants to collect and concentrate a valuable element from soil, to the plant as a processing agent to convert an element from one chemical or physical form to another (for example from a metallic salt to a metal nanoparticle) then it is sensible to provide the elements for processing. It is also preferable to therefore grow the plants hydroponically, which enables very good control of the solution concentrations of metallic ions available to the plant. 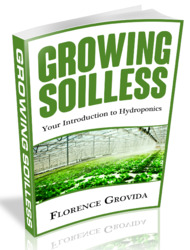 Hydroponic growth also enables very high concentrations of metals in plants to be achieved. The accumulation of metallic elements in plants does not necessitate either the formation of the metal element in a reduced (elemental) form or the formation of the metal into elemental nanoparticles. Most studies of metal accumulation in plants analyse the plants for the total amount of the element present, not differentiating between the metal salt and the elemental form. Since this chapter is about metal nanoparticle formation, we need to distinguish between accumulation of the element and formation of metallic nanoparticles of the element, in this case silver. The first deliberate formation of reduced silver in plants resulted from studies of the activity of the chloroplast (Weber, 1938). These studies generally used fresh pieces of plant but not whole growing plants. Nanoparticles of silver, roughly 50 nm in diameter, were formed in a number of plant species and identified by the scanning electron microscope (Brown et al., 1962). Most of the work on silver nanoparticle formation in plants has been in vascular land plants. Generally fast growing, soft tissue plants have been used, primarily since these are most amenable to laboratory study, but also because they would be easy to cultivate as a crop on a large scale. The list of species that have been used to make silver nanoparticles are contained in Table 1. 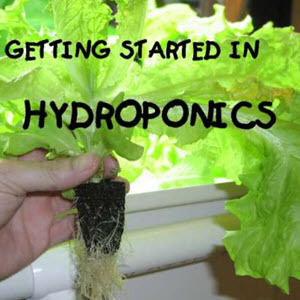 Silver concentrations in plants grown hydroponically increase rapidly in the first few hours (Haverkamp and Marshall, 2009) to reach a maximum after less than 24 hours for Brassica juncea and perhaps 48 hours for Medicago sativa depending on the hydroponic concentration of silver (Harris and Bali, 2008). Plants have been shown to be able to accumulate silver to concentrations in the whole plant of up to 12.4% for Brassica juncea and 13.6% for Medicago sativa (Harris and Bali, 2008). With a growth medium containing not only silver, but also gold and copper, alloy nanoparticles can be formed (Haverkamp et al., 2007). It is perhaps surprising that plants are able to take up significant quantities of silver considering the toxicity of silver to many organisms. There is a variety of methods for observing silver nanoparticles in plants. 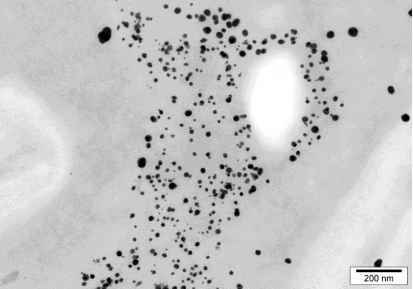 The formation of silver nanoparticles can be seen by TEM where dense particles show up as dark features because of their electron density. Better still, using electron backscattering, regions that contain high atomic weight elements show up as bright features. Both of these techniques give a good indication that the particles formed contain silver. However, an alternative explanation for these particles, which is not eliminated by this method, is that they consist not of Ag metal but of a precipitate of Ag such as AgCl, AgNO3 or some other compound. Therefore more specific techniques are required to positively identify the composition of the observed nanoparticles. Energy dispersive X-ray spectroscopy (EDS or EDAX) can be used to positively identify the presence of silver in nanoparticles in plant tissue. However, the technique is usually limited to heavier elements so that it is not always possible to tell with certainty that the silver is not precipitated with a light element as a salt. However, it gives a more reliable indication than electron density alone. X-ray diffraction of the whole tissue could be used to identify the presence of nanoparticles of silver. This has been used for gold nanoparticles in plants, and enables not only the confirmation of the identity of metallic gold based on the diffraction pattern, but also provides the average crystallite size (which for small particles is likely to be the same as the particle size). It does not appear yet to have been successfully applied to silver nanoparticles in plants. Electron diffraction and high resolution imaging of silver nanoparticles under the TEM can be used to determine the lattice spacing of the crystals observed and therefore distinguish between compounds of silver and metallic silver (Haverkamp et al., 2007). UV-visible absorption can be used to indicate the presence of silver nanoparticles and to give an indication of particle size and is widely used for this purpose. A robust technique for identifying the chemical state of the silver present, and quantifying the proportions in different chemical states is X-ray absorption spectroscopy (XAS). Both XANES (X-ray Absorption Near Edge Spectroscopy) and EXAFS (Extended X-ray Absorption Fine Structure) fall under this technique. XAS typically requires the use of synchrotron radiation, although laboratory scale XAS instruments are now available. XAS is able to positively indentify silver metal in plants and distinguish the metal from salts of silver by the shape of the XANES spectrum for the different chemical states of silver (Figure 1). Figure 1. XAS spectrum of silver compounds. 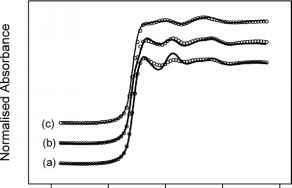 a) Ag metal; b) Na3Ag(S2O3)2; c) Ag(NH3)2NO3; d) AgNO3. One of the first applications of XAS for the identification of metals in the reduced state in plants was for gold (Gardea-Torresdey et al., 2002; Marshall et al., 2007) but more recently it has been applied to silver (Haverkamp and Marshall, 2009). In the TEM of sections of Brassica juncea leaves, after uptake of AgNO3 to levels of 1.1% Ag in the leaves (Haverkamp and Marshall, 2009), particles which are relatively opaque to electron transmission are visible (Figure 2). The composition of these particles can be partially determined by energy dispersive X-ray analysis which can identify the presence of silver (e.g. (Haverkamp et al., 2007)) however this method alone does not distinguish between silver metal and small particles of a silver salt (e.g. AgCl or AgNO3 crystals). To positively identify the presence of the reduced form of the metal it is necessary to use a technique that gives information on the chemical state of the silver, such as XAS, or the crystalline form such as XRD. Using XAS, reduced silver has been positively identified as the form of 50% of the silver in Brassica juncea when a level of 1.1% Ag is present (Figure 3a). The balance consisted of silver nitrate which had not been reduced and probably some other unidentified component since the fit was not very good using only these two components. From the XANES analysis (Figure 3) it is found that when Brassica juncea plants are grown hydroponically with different metal salts in the growth medium different proportions of the silver are reduced to the metal. With AgNO3 taken up to a level of 1.1% Ag in the dried plant only 50% is reduced to metal, with Ag(NH3)2NO3 taken up to a level of 0.9% Ag 30% is reduced and with Na3Ag(S2O3)2 taken up to a level of 0.3% Ag 10% is reduced. This difference in the amount of silver reduced is in keeping with the thermodynamic driver for the reactions as will be explained below. Figure 2. Silver nanoparticles in Brassica juncea after AgNO3 uptake. Figure 3. XANES spectrum of dried Brassica juncea leaf after uptake of a) AgNO3; b) Ag(NH3)2NO3; c) Na3Ag(S2O3)2. Circles, data; Solid lines, fitted curves formed from linear combinations of standard spectra.